Mumbai, May 8, 2017: The boxing fever is soon to grip India with its first ever Super Boxing League (SBL) to be held in New Delhi from July 7 to August 12, 2017. 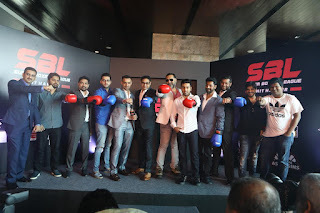 The league is being organised by British businessman Bill Dosanjh, also the founder and promoter of successful Super Fight League and professional boxing sensation & two-time world champion boxer, Amir Khan. SBL has roped in Sony Pictures Networks India as the broadcast partner for on-air as well as online streaming of the league. The league will be telecasted live on SONY ESPN and SONY ESPN HD at the prime time slot of 7-9:30pm over Friday, Saturday and Sunday and will be live streamed on SONY LIV. The schedule of the matches is available on the website of Super Boxing League. For more information, please visit, www.superboxingleague.com.